Joplin, Mo. — Behind strong finishes in the cross country and indoor and outdoor seasons, the Missouri Southern Men’s Track and Field team finished third, its strongest finish ever, in the United States Track and Field and Cross Country Coaches Association Program of the Year standings as the organization announced the final standings today. The Lions finished seventh in the 2016 Cross Country Championships, 13th at the Indoor Championships and sixth at this past weekend’s Outdoor Championships for a total of 26.5 points in the standings. It is the highest-ever finish for the Lions with the previous high being fifth in 2009-10. 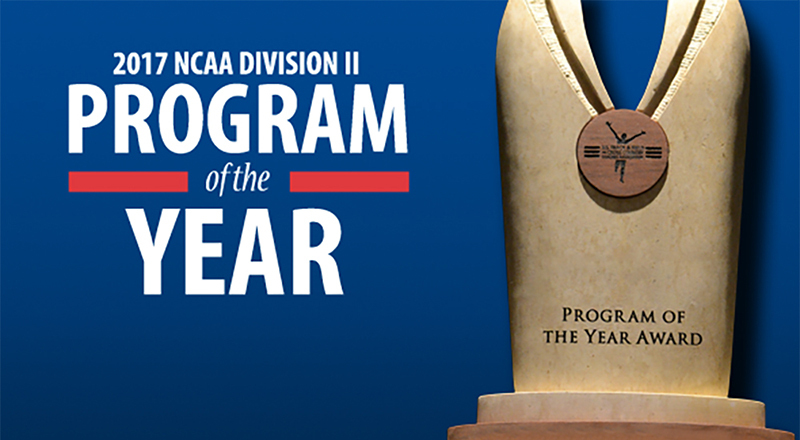 The USTFCCCA Program of the Year Award is bestowed annually to the most outstanding cross country/track & field programs in each of the NCAA’s three divisions and for each gender. The award honors the institution that has achieved the most success in each academic year (spanning the cross country, indoor track & field, and outdoor track & field seasons) based on the institution’s finish at the NCAA Championships. In order to be eligible for the award, teams must qualify for each of the NCAA Championships. Scoring is based on the team’s finish at each NCAA Championship in cross country, indoor track & field, and outdoor track & field (i.e. 1st = 1 point, 2nd = 2 points, 31st = 31 points) with the lowest total score for all three championships combined determining the award recipient. Ties among schools split points for positions taken. Adams State won the award and was followed by Grand Valley State, Southern, Academy of Art and Alaska-Anchorage to round out the top five in the standings. Western State was sixth, followed by Colorado State – Pueblo, Lee, Southern Indiana, Colorado Mines, Hillsdale and Minnesota State – Moorhead to round out the top 12.